Regulators' proposal to slash the yearly figure by 80 percent has fishermen wondering if they'd be working just to cover bait costs. At the height of the season, Brooklin lobsterman David Tarr spends $600 to $800 a day to bait his traps with herring, pogies or redfish. While some Maine lobstermen swear by herring, Tarr is willing to play the field based on price and availability. Unlike most of his peers, Tarr also has the luxury of a personal bait cooler, which allows him to buy bait when the price is right, salt it himself and store up to 200 barrels of it away – $40,000 of bait, enough for a half-season of fishing – for use during tough times. 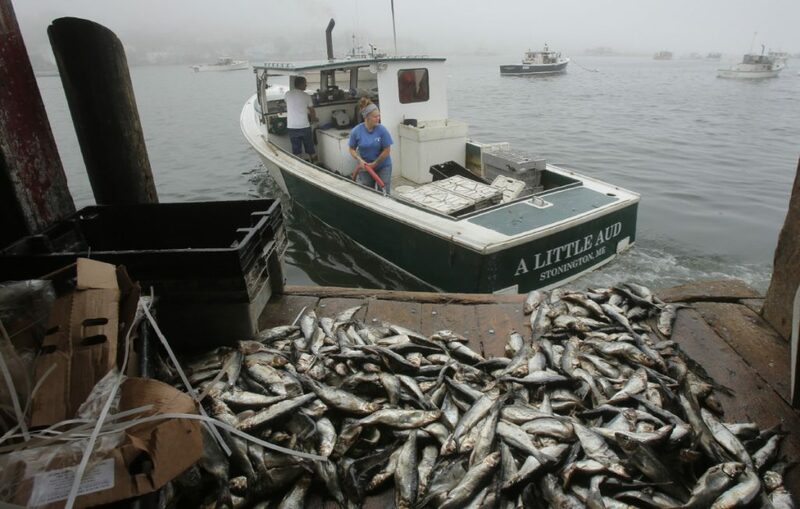 On Wednesday, one day after the New England Fisheriesy Management Council voted to recommend slashing the yearly herring quota by 80 percent, Tarr figured tough times are coming. He plans to spend the spring stocking his bait cooler before the lobster season kicks into high gear and bait prices go up, possibly doubling at the peak of the season. One thing that Tarr probably won’t be doing in the spring? Lobstering. Every lobsterman will be doing exactly the same math, Tarr said. They’ll look at their daily bait bill, and then lobster prices. Then they’ll figure out how much lobster they would have to catch just to cover their bait bill, and estimate the likelihood of surpassing that threshold. For Tarr, that means he needs to land three crates of lobster – about 270 pounds – to cover his daily bait bill alone. The Maine lobster industry had been bracing for bad news on the herring front, said Kristan Porter, the head of the Maine Lobstermen’s Association. With the number of juvenile herring at all-time lows over the last five years, lobstermen like Porter figured regulators would take some action to protect the long-term future of the stock. But he was surprised at the extent of the cuts. In 2017, regulators set the Atlantic herring quota at about 111,000 metric tons – 101,000 metric tons of yearly quota plus almost 10,000 metric tons of unused 2016 quota that was rolled over. In 2018, regulators cut that quota down to about 50,000 metric tons to offset the preliminary findings of a declining population, especially among juvenile herring. That sounds like a huge cut, but it is essentially what the herring fishery landed in 2017. According to federal landings data, the herring fishery landed 49,000 metric tons of fish in 2007, or about 48 percent of what it was allowed to catch. Only one area of the fishery, the zone that hugs the inshore waters of the Maine coast, landed almost all of its quota, the data show. Regulators believed that even that reduced quota, or allowing the industry to catch what it had caught last year, would hurt the fishery’s ability to rebound, so earlier this summer, after preliminary scientific findings pointed to a severe juvenile shortage, regulators began to talk about reducing the quota even more, possibly to as low as 30,000 metric tons. But on Tuesday, after the council listened to staff scientists use words like “collapse” and administrators talk of a “state of emergency,” the council voted to ask the National Oceanic and Atmospheric Administration to adopt a 21,266 metric ton yearly quota for herring, of which 14,588 metric tons would be available for catch by U.S. commercial fishermen. That is lower than what even in-the-know lobstermen like Porter had feared, and it will definitely change how lobstermen fish, he said. Porter, who fishes out of Cutler, has always used herring, but this year he has begun to experiment with menhaden, also called pogies, to hunt for ways to keep his business plan as insulated as possible from the ups and downs of the bait market. Frank Gotwals, a veteran lobsterman out of Stonington, said he has already tweaked his fishing practices to minimize his use of bait. If prices double, as some industry officials fear, he will simply sit out the shoulder seasons in the early spring or late fall, when the typical catch is marginal. This spring, when bait prices were high, local fishermen were letting their traps set out longer between hauls. Hugh Bowen, a Freeport lobsterman who sits on his local lobster zone council, said smaller operators will have the hardest time. Porter said there’s not much that Maine or industry groups like the Maine Lobstermen’s Association can do to ease the pain of the bait situation. Lobstermen usually buy bait from the people who also buy their lobster, such as their fishing co-operative or their dealer, and only some of them have the ability to store large amounts of bait. Most will probably put fishermen on bait rations. Politicians like Walter Kumiega, an outgoing state representative from Stonington who co-chairs the marine resources committee, said there is little the state Legislature or state government can do to bring in more bait. The best case scenario is that bait prices go up, but the supply remains stable, he said. If supply is so short that people can’t fish full gangs of gear, coastal communities will take “a dramatic financial hit,” Kumiega said. Maine can consider expanding the list of legal baits that can be used in lobster traps, Porter said, but they must be careful not to add a fish or animal bait that could introduce a disease or invasive pest into Maine waters that could hurt the lobster fishery or any other. The bait dealers already are on the hunt to find new sources of bait, Porter said. The O’Hara Corp., a national bait dealer out of Rockland, told the council it is hiring somebody to scour the globe for new bait sources. O’Hara’s Mary Beth Tooley predicted that lobstermen would keep fishing, but warned that the council might not like what they stuff into their bait bags if they can’t find herring, pogies or redfish. But not everybody in Maine is upset about the council’s efforts to reduce herring landings. Some, like Zack Klyver of Bar Harbor Whale Watch, say a reduction is necessary to help rebuild the herring population, which plays a critical role as food for predator fish, like tuna and striped bass, as well as the Atlantic puffins and whales that thousands of people flock to Maine to see each year. Klyver belongs to CHOIR, a group of commercial and sport fishing groups, ecotourism companies and environmental groups that have been asking regulators to leave more herring in the ocean for the animals, birds and whales to eat. Without them, the herring predators leave for other waters, which hurts other fishing groups and Maine tourism, he argues. His company, which is Maine’s largest tour operator, has been in business for 30 years. They have tracked their success rate – any trip they spot a whale is considered a success – over that time. Through 2016, Klyver said the lowest season average was 80 percent. But last year, Bar Harbor Whale Watch clocked in at a very disappointing 34 percent success rate, Klyver said. Klyver lamented the demise of a regional fishery, but he said there were other fisheries that regulators must consider, too.